The Buzz Cola Corporation unveils their plans to open a new factory in Springfield. The townspeople rejoice as the expansion brings new jobs to their humble town. However, there is something with darker intentions lurking. It is brewing a darker plan for the future. A conspiracy brewing in Springfield. And one family is about to be at the heart of it all. 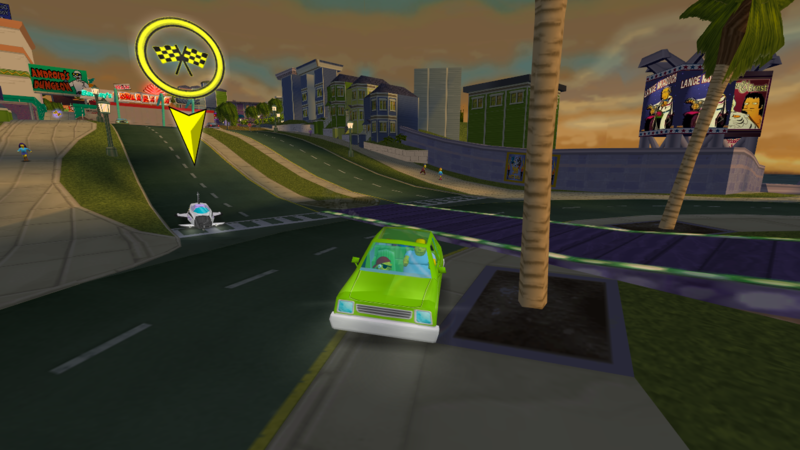 Donut Mod is based on Hit & Run's original campaign and content. The main goal of the project is to replace all of the missions with new ones and revamp side content. 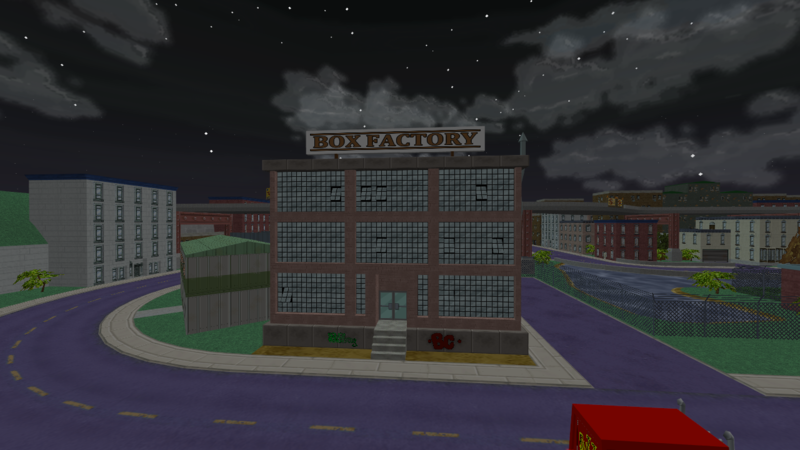 The story is an expanded version of the base concepts seen in Radical's story with altered or entirely new plot points as well as entirely new characters. Normal: A more relaxed experience that follows a difficulty curve similar to the original game. Hellfish: A much tougher experience that starts off challenging and expects you to be very experienced. There are several new and revamped vehicles in this version of the mod. This version of the mod features 3 new outfits for every player character plus several for non-player characters. Marge actually stayed here in an episode of the show and the room is based on that appearance. The art on the walls is drawn by our artist, Tyler. The view outside the window is a low resolution screenshot of the outside area. This is done to be consistent with how Radical's interiors were made. 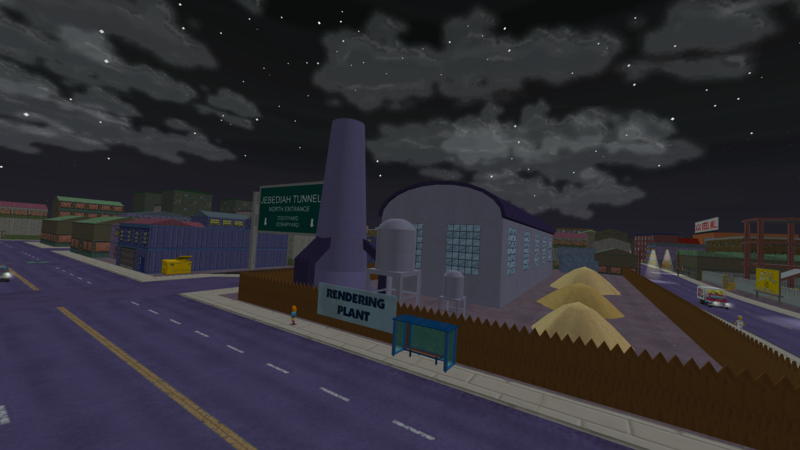 The rendering plant was one of the earliest structures in the map although it had no textures until very recently. The tunnel adjacent to it is named after Jebediah Springfield. 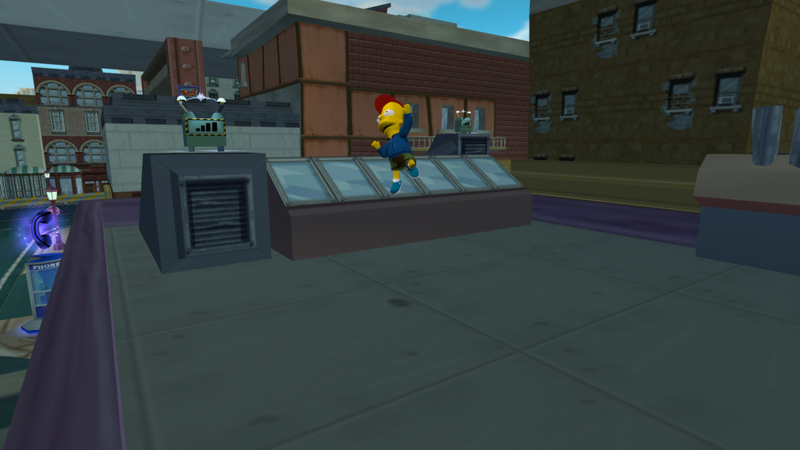 The Springfield-X sign is randomized between two textures to represent both appearances in the show. Donut Mod 4 is not available yet. Want to contribute something to the project and have your work featured? Check out the Community Billboard Submission thread. While Donut Mod 4 is being developed, you can go ahead and revisit the project's humble beginnings by downloading the open source version of Donut Mod 1, also known as Project Donut. See the General Information thread for more details. While you wait for Donut Mod 4, you can try out the current release Donut Mod 3. 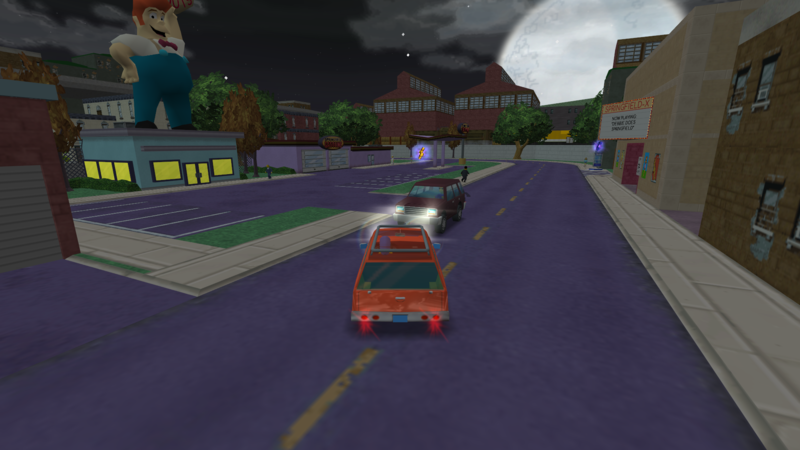 This release features the first 3 levels of the mod. See the Downloads page to get the mod. We recently published an unedited and unfiltered concept document for the cancelled Project Donut sequel. On September 2nd, 2018 we archived our old General Information thread in order to get fresh analytics (votes and view count) on this new one. If you'd like to view the old discussions, they can be found here. A progress update detailing where the project is at was posted as a response to this thread. Added more screenshots of Level 4. Renamed the "Gameplay Demonstrations" section to "Videos". Added the Gameplay Trailer to the Videos section. Updated the screenshots section to use spoiler tags. Added titles to the Screenshots section. 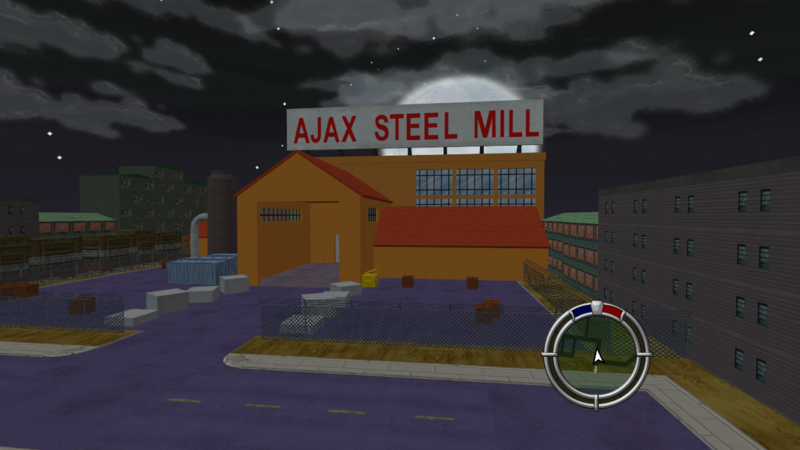 Added the Ajax Steel Mill snapshot from the October 2018 Mini Status Update. Danny Nice thread and nice videos, now let's just wait for Donut Mod 4 release. Nice thread and nice videos, now let's just wait for Donut Mod 4 release. The community has voted this post below the point threshold. This means the post is either viewed as inaccurate, unhelpful or does not contribute to this thread. This is the kind of info that we have been wanting for a long while, and it makes me wonder why it couldn't have been done sooner? Why did it take so long to actually make a video like this when there's obviously been demand for it for a long time? Now I'm not an expert on making a video or anything, but for something like this it really boils down to writing a script, recording footage, recording a voiceover and editing. In total, if nothing else gets in the way, it should only take around a week and a half, depending on the length of the video. So I'm not sure why it's taken over a year for one video like this to be made. Frequent updates are a very useful thing to have, it helps show that progress is indeed being made, and what kind of state it is in right now. Let's take Colou's new video about his upcoming mod, Cops in Springfield. It's in a very early concept stage, with very clear 'work in progress' areas, and there's very little fancy editing or effects going into it. It's just him playing the mod for about a minute and showing off what he's done so far. It's a very simple, quick video that just shows what's actually gone into the mod. Other mod creators are doing similar things too, Gordon CMB has started doing a 'weekly leek' which is essentially the same thing as Colou's video, but on a fixed, regular basis. Now my thought is, why doesn't Donut Team do something like this? I mean yes, there's the gameplay demo of The Fat and the Furious, but it's clearly a well thought out, scripted video when honestly it doesn't need to be. My thought is instead of just saying that there's this 'new exciting feature' create a little tech demo showing it off, so that people get a better idea of what it does and how it could be used. Going back to that ASF post I made (which looking back I structured that post pretty badly) it was entirely down to a lack of communication on what it does and how it could be used. All that we really new was that it was some amazing new thing that would allow for cool new scripts and mission types which have never been seen before. This created the idea of something that was going to allow almost unlimited modding potential, when in reality it was just some simple (although admittedly cool) new commands, that if you sit down and think about it enough you can probably begin to see how they were created. It was all down to miscommunication, and I'm not sure if there's enough being done to actually rectify that. Another point that I have is how before this status update was released, the way it was talked about implied that you didn't want to do it, and that it was coming out of force from the users. "we're now saying we'll make a status update because everyone is now spreading around misinformation and we're sick of being told that it should be done by now." I'm a bit confused as to what misinformation is supposed to be being spread, outside of my 'misinformation' which I've already explained numerous times. The general consensus is that people are repeatedly asking whether or not it is done, which is very dumb because it's clearly not ready. However there is a huge lack of information which leads to all this confusion and 'misinformation' The status update has indeed answered some of our questions, but just as I predicted, there are still many unanswered ones. If you need to be forced into making a status update because of misinformation then there's clearly something wrong here. I don't know if you're fully aware of just how quiet you're being about things, and a status update like this is the only real way to get proper information, and the rest of it just has to be assumed. And I still stand by my assumption of tools being delayed, because it seems pretty solid given the amount of information that we know, especially at that point in time. If we take a look at all the new and upcoming tools and mods, you begin to see a pattern. Donut Mod 4: Delayed for an unknown amount of time, because "it isn't ready"
Map Builder: Very little info outside of "it isn't ready"
Mod Launcher 1.19: Meant to be ready nearly a month ago, when it was 1.18.4. No further info has been given, except that "it isn't ready"
There's a pattern, with everything being "not ready" for unknown reasons. So assumptions have to be made here, unless proper info is given. And it still hasn't. Donut Mod 4 is great and all, but a large portion of the community are far more excited about other tools. We want info on them too. Not just DM4. As Colou put it, "DM4 is just a mod, which is fun and all, but doesn't actually help with my modding." So I think as a community we would appreciate if tools like the map builder were given more of the spotlight, as they're much more important to modding as a whole. I don't see why saying "it isn't ready" is not a good reason to not release something. The staff members aren't going to give out something that's not ready and without trying to be disrespectful here, you are the only one (that has been open about it at least) who thinks that saying it's not ready isn't enough. the map builder from what I know about hasn't been updated in ages (correct me if I'm wrong) so what would be the point in mentioning every month that it's not been worked on. 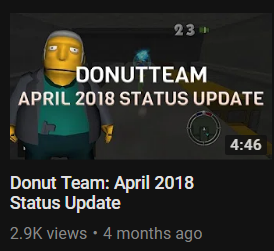 I will also put my opinion here about why I think some things have been delayed and I have a feeling that other staff members are going to disagree with me on this but I think one of the problems is that we don't have enough staff or people working on donut mod but at the same time I can see problems with having too many members working on these projects to get them finished. also because of controversy in the past with several ex donut team staff members its hard to have enough people working on a big project like this without stirring some drama and kicking members from these projects so we can't win either way. Also yes there has been a lot of misinformation being spread especially on the Discord server. People start assuming deadlines for donut mod and the map builder. 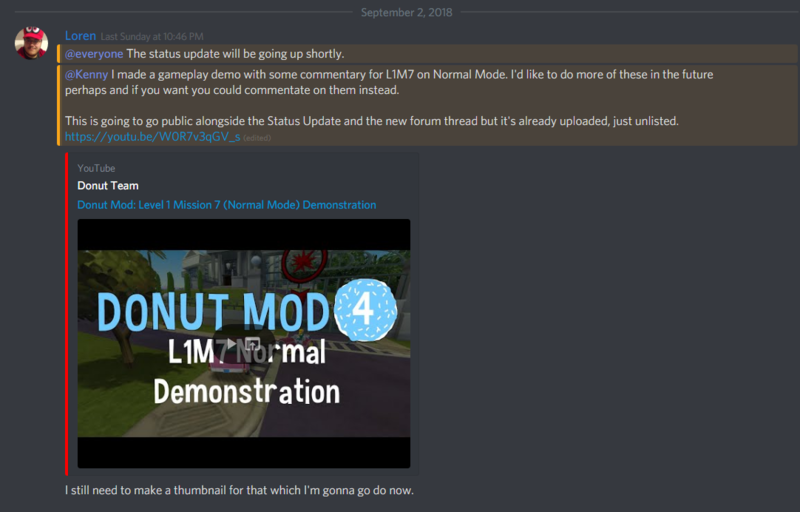 every so often you hear users asking questions like "you said donut mod was coming out in September where is it"? which we have never given out deadlines for the past couple of months to prevent questions like this and it happens more than you think. dunno if what I said was useless or unhelpful but I thought id bring this up anyway. I don't think saying it isn't ready isn't enough. If it isn't ready then it isn't ready, end of. However that just seems to be the response to absolutely everything, and it can get a bit tiring after a while. Glad you enjoyed the new status update! Me and the team are exceptionally proud of how well it went and we're really excited by the feedback we've been given. People seem to be enjoying the new L1M7 I designed, feeling it addresses some major design flaws present in the version we put out in DM3. Loren is also happy in that the general public feels as if the map feels a lot less generic with the inclusion of new environmental buildings. Jake is dealing with PTSD-esque flashbacks of Shrek 3, but the spoiler feature is helping him cope. We're definitely making progress at this point, and the reception has been very positive. I'd like to take a second to thank everybody for that! I know it may not sound like much coming from me (the dude who lurks in the shadows usually), and we know the wait has been tough, but it's getting there!...For real this time! The development time of the video was approximately a week, which is roughly the same time estimate you guessed earlier for the average video. The video's production (and delay) began as a combination of things. While we wanted to address some legitimate concerns regarding our projects and wished to clear the air over some things, there were some other factors to it as well. While it may not initially seem like it, we had actually been wanting to push out an update for quite a while now, but we weren't really certain about how to push it out, if this makes sense. There was another video concept we had been toying with for a while now that was more ARG-esque, but we decided to toss due to the development time setting it up would've taken, and because we really wanted to showcase something, which is when the development of the current video you see began. I think it was the appropriate choice, as I think everybody wanted some more direct information at this point and was tired of the vagueness of the mod's contents. We might re-explore the concept at a later date, but for now, more "direct" statements with the mod's development are our priority. A lot of the development time that's been keeping Donut Mod 4 away from release, as you probably figured, is the new Level 4 map headed by Loren. While the map is incredibly impressive, and I don't wish to put Loren's efforts down with this statement, I think we found it a bit difficult to properly showcase the changes and new additions in our videos for a variety of reasons. The videos in question run around a good 4-6 minutes. It can takes ages to model something, but a bird's eye view can basically tell you everything about a map since it's basically a 'canvas' for actual gameplay. It might come off as slightly underwhelming if just a model change by itself was presented in a video, as it'd be difficult to stretch the runtime accordingly. A 30 second video in somebody's feed might also lead to a resounding "meh", to put it nicely (and we wouldn't blame them). Even if this was reduced to something such as a forum post, it still wouldn’t be much to show. People want the complete picture, and we can’t blame them! I place emphasis on Loren’s direction here, as he’s currently the only one modelling and building the map layout in Sketchup on our team. A mission script, on the other hand, has a lot more gameplay elements that are easier for the casual audience to engage with, which is who we're focusing on the most when setting these things up. 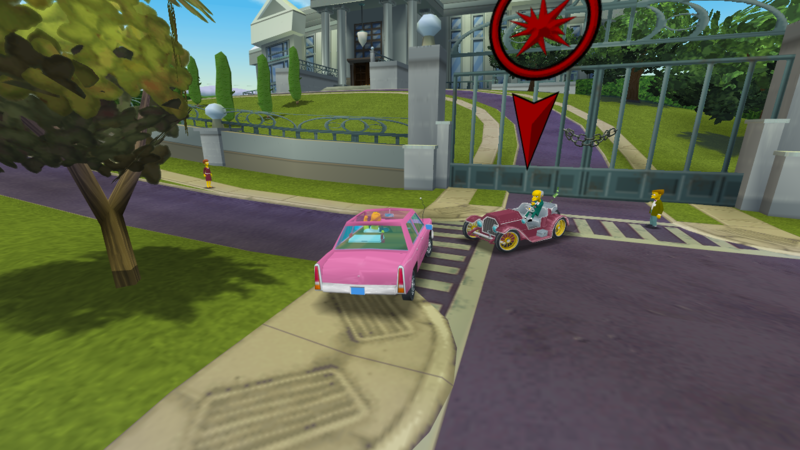 It can feature a variety of unique gameplay concepts (as we've seen with Colou's phenomenal work with the storm in SOS, providing a unique visual hazard that the mod created proper buildup to), an engaging storyline/humorous character interactions (as we've seen in mods such as Housewife Duties/Wiggum in Zombieland), or showcase entirely new car/character models (Nightbane's excellent Annoy Squidward Day mod). The best way I can state it is that these missions make use of a 'canvas', when we're still working on a completely new canvas to use. Loren also wants to keep certain elements of this map a surprise. This map and concept is very much a passion project for him, and there are a couple of little goodies and details he'd like to keep under wraps until it's time for release. We as a team wish to respect his wishes, and won't share anything from the map he's personally uncomfortable with until it's time. While I do understand you had concerns that gameplay footage spoilers don't really ruin the mod, others might feel slightly differently and would prefer to go into the experience completely blind. In addition, there are also some critical plot-related areas in the map that are going to tie into the story we're looking to tell. This is sort of the reason there haven't been many screenshots of the map in more detail. We're trying to find a good balance, and hope others understand. I realize this might not sound incredibly satisfying to hear, but you do have our assurance there is progress being made, the difficulty is just figuring out an attractive way to showcase it to the best of our ability for everybody. Hopefully sharing that will give you the idea of how transparent I'd like to be going forward. You probably won't be seeing any major "mysterious" teases anytime soon from us on our official channel/public Twitter, and that's likely for the better. This includes more general things, like the ASF scripting functions you mentioned. We apologize, but we were initially very excited about expanding SHAR's (very limited) mission objective potential in new and more organic ways. It may not be a complete game changer, but for those looking to make a fairly expansive mod, there's more objectives for them to play with to prevent repetition, an issue I personally feel SHAR starts to suffer from near the end of it's runtime (hello, Alien "Auto"topsy!). Pretty much every objective the game can present is showcase by Level 3, with the Waste Barrel only being the major new one. Somebody looking for an entirely new experience might be a bit disappointed knowing there isn’t much else that can be explored objective wise, and this will hopefully allow already well-designed mods to become more varied. Things such as the derby we did way back in Donut Mod 1 were very hacky, and these new objectives are much less so. Knowing we can play with this game further is a testament to how great Lucas' reverse-engineering skills are. I've already seen people making wonderful use of ASF, and am looking forward to more in the future. Lucas’ reverse-engineering skills also play a key role in the other tools that were mentioned. A lot of this plays a key role into why we’ve been hush-hush about the model builder as of recent. I will admit for the sake of transparency I have no involvement in these tools, I’m afraid. My current job here is simply as a mission scripter. I have not assisted in the development of these tools in any significant way, and have in fact never launched them, even out of sheer curiosity. I can say, however, that Jake’s comment earlier about the documentation is accurate. Lucas is very much a perfectionist when it comes to his work, and I fully trust that the inner-workings can get pretty complex. Loren and Jake have been working very closely with him over the past few years to bug-test these builds and give general feedback, and also contribute to the code directly. Because of this, there’s a lot of beta-testing that goes on directly inside the Dropbox. It’s a very exciting process that includes a lot of formal/informal chatter. As a result, we’ve ended up getting excited in the past and announced or teased things as soon as we could, simply because we wanted to communicate with the community that soon another barrier would be completely shattered. We share a lot of the same interests as everybody else here, and want to see SHAR as a fully-moddable game with virtually no barriers. At the same time, much like with Loren’s concerns about the map, we don’t want to reveal too much or give out too much to early. Lucas would really not be accepting of releasing the map builder in a half-finished state because of his mindset, and we as a team wish to respect his choices. He’s definitely the biggest contributor to this scene as a whole! If the documentation isn’t in a state he’d consider “acceptable”, it’s currently hard to convince him to release it otherwise. The documentation just isn’t up to snuff, and Lucas wouldn’t want that stuff being out publicly then.This is probably the best way to explain what Jake had meant about the lack of documentation. The tasks Lucas is facing and current setbacks with his PC is also why The Mod Launcher update has been delayed for a bit. We apologize for the silence, but Lucas has been running into some PC-related issues that are making it difficult to properly compile the Launcher for release. According to Loren, Lucas just recently got everything back up and running, which probably means development will be back at a steady pace in just a bit. An approximate release date I don’t really want to say just yet since I’m not quite certain about the technical side of things, but I hope this response is more satisfactory. I apologize if anything I said in here came off as rude or over self-explanatory, but I think there are some valid points here in your post and don’t want to sound as if I’m dismissing them outright. It’s currently a wee bit late for me, and I do have some college work to attend to, so I also want to apologize if my logic here seems a bit scatterbrained!. I also want to apologize if I misinterpreted anything in the post I was replying to. We’re very eager to share the stuff we have in store, and I can understand wanting the model builder to create your own completely unique content. I can also completely respect the opinion that Donut Mod 4 doesn’t interest you as much as a result. However, you have our assurance Donut Mod is holding absolutely nothing back! If anything, Donut Mod is the reason this stuff exists. The ideas we had for the mod lead to us reaching out to Lucas and striking a deal, and we’ve made fantastic progress as a result that we want to share with everybody. We just also want to make a product that’s presentable when it’s presentable, if that makes sense. We’ve gotten excited in the past, and I want to apologize for it. We’re a bit worried about showcasing a bit too much to the point it might be underwhelming, or simply reveal too much and ruin the wishes of Loren or Lucas. If you have any further concerns about the mod or anything in general, I highly encourage DM’ing me personally on my Discord account. I’d be more than happy to talk with you there! theniceguyhere567 Looks great man. Now we wait for Donut Mod 4 any day now. Looks great man. Now we wait for Donut Mod 4 any day now.